Tiles - the palette for my mosaics! Increasingly, I am being asked what kind of tiles I use for my original mosaic art, and where I get them. The truth is, I haunt DIY shops, tile shops , skips, warehouses (my particular favourite), wherever - oh, the glamour! I especially like the 'on offer' tiles because no-one wants them - too few and often chipped - no problem! Making a sunflower - petal-shaped tiles at the ready! I sometimes come home to find a pile of tiles on our doorstep from friends who know I will always give them a home! No tile gets thrown away because it might just be the colour, texture, depth I'm looking for...! So, I have your common wall tile (floor tiles are generally too thick). The first thing I do is to snip the manufactured straight edge away - its against all my principles! Then depending on what I am making, I start to snip the tile into shapes, and it all starts to come together. Often the shapes that just happen with this snipping process suggest ways of using the tile, which I haven't previously thought of, but work! See the tiles above I have snipped for my sunflowers? - crescent shaped, loads of different colours, shades and thicknesses. I then lay them on the wood with the design already drawn on it, and fit them together, snipping along the way, to fit as I want. The great thing about cutting all my own tiles is that I can create the movement and texture I want, like strokes from a paintbrush - petal shapes, or middle seeds for example, in the sunflower. My tiles are my palette. I then start sticking - the glue takes about an hour to set properly, so I have time to make sure they are giving the effect I want. The space I leave in between the tiles is vital - the grout and colour tint I use brings out the colours and mood of the piece. So the tiles are very ordinary, many recycled, but with the way I put them together, I can create vibrant, original enduring art and continually strive to create impressionistic realism. Leaping salmon - can you see the glints in the water? I made those! Some days of course 'the cutting gods are not with me' (as my children say) and I have learnt to stop, make a coffee, give it all a good coat of looking, and come back later. Some tiles, especially the thin ones, can be very temperamental! The effects I can create with tiles are limitless, giving perspective, texture,vibrancy and dimension. If I can't find the tiles I'm looking for, I've started to make them. For example, on the leaping salmon mosaic above, the glints of light in the water are proud from the other tiles as they are two tiles thick - a basic white tile with a mirror tile on top - loved making them! Once I am happy with the tiles, where they are and how it all feels, then comes the grouting.. but that's a whole different blog..
My ever growing palette of tiles - all welcome here! Please do ask any questions you might have - why not give it a go?! Antonio Gaudi - 'God's architect"
Some of my work is influenced by the amazing and eccentric Antonio Gaudi. He lived in Spain in the late 19th century and early 20th century, and most of his distinctive work can be seen in Barcelona. His passions were architecture, nature and religion, which can all be seen reflected in his work. He delighted in integrating ceramics, stained glass, wrought ironwork and wood in his original designs, and organic style. He didn't plan his work, he just let it emerge and lead him, at times. My mosaic sun bowl is inspired by it! A section of the Sagrada Familia - plus cranes! An example of this is the Sagrada Familia - which is one of the most visited monuments in Spain. It is still a work in progress, but reflects Gaudi's religious devotion. He was nicknamed "God's architect". His work is breath taking and unforgettable. It's a bit grim outside here in Bristol today - squally, cold, wet, muddy and dark at 4pm! So, I thought I would share a bit of spring colour! As you can see, I love sunflowers! Always uplifting and cheering, and surprisingly easy to grow! When I'm in tile shops - of all shapes and sizes - I am always on the look out for different shades and textures of tile - so that my mosaics really come to life with a 3D effect - hard to see in photos but lovely to feel and see in real life! I have been particularly lucky with yellows. 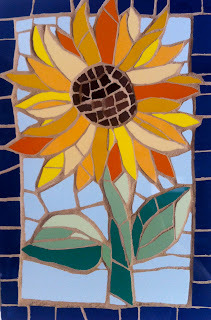 oranges, reds, golds etc for my ever growing collection of sunflower mosaics - different sizes to accommodate all tastes and budgets. Nothing like a bit of spring colour all year round! My sunbowl was inspired by a trip to Barcelona, and witnessing the eccentricity of Gaudi first hand. 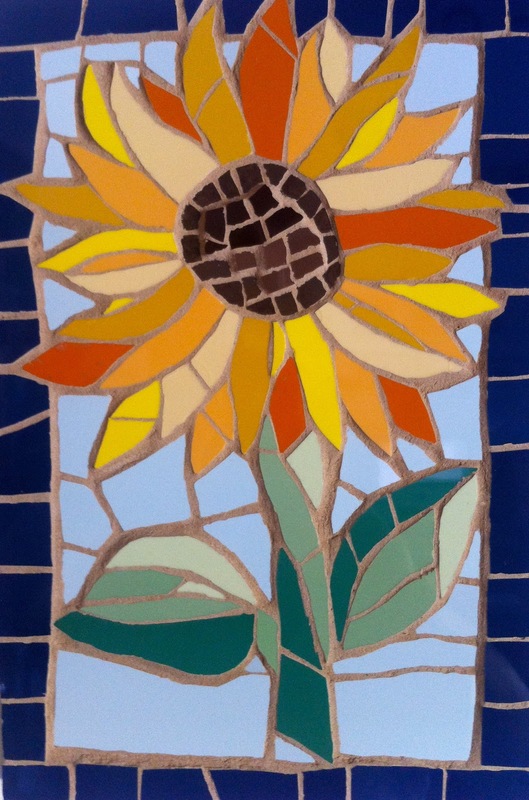 This sunflower, I guess, is my best seller - I never tire from making it, as each one is different, using all the tiles I've collected in a unique way. This garden mosaic was commissioned by a keen gardener for her 50th birthday - "Flowers all year round", she says!